You can’t give me a hard time for serving up a short Office Thursday post, because c’mon, this whole week has been one big Office Thursday, agreed? 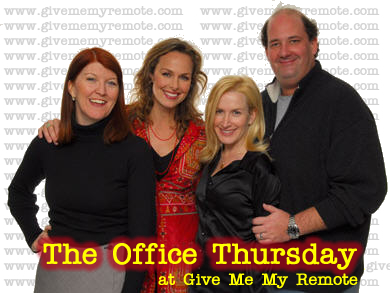 Congratulations to the cast and crew of The Office for getting an early pick up from NBC for next season. I don’t think anyone doubted a 4th season, but the early announcement is a sign of respect from NBC. CONGRATS!!!! I guess I’ll start off by letting you know that we will in fact we having our weekly LIVE Office chat tonight over at BuddyTV.com. As always, we’ll be gathering around 8pm EST and chat it up throughout the show. I’m looking forward to seeing the regulars tonight, and let’s see if we can’t persuade a few newbies to join us. Click here to set a reminder about tonight’s chat. “The Return”: Oscar returns after his 3-month company-paid vacation but is he already reconsidering his future at the office? Meanwhile, the new Devil of Dunder Mifflin, Andy, exploits recent events to inch closer to Michael. Not dawesome, not dawesome at all. On the other side of the office, Jim colludes with Pam and Karen to trick someone in the office—but the target’s not Dwight. And I’m going to go out on a limb and say that we are going to have yet another episode where Jim and Pam don’t talk to each other about what’s going on between them. Prove me wrong Greg Daniels…prove me wrong. For the first time, I have decided to NOT watch the preview clips offered up over at Yahoo!. It’s a bold decision on my part. Wait, is bold the right word? Here’s the deal. I usually watch the clips within 30 seconds of them being live. Fast forward to Thursday night and I am completely bummed out when I realize I’ve seen so much of the show already. The Cast of The Office at the Golden Globes: Check out these pics of the whole cast walking the red carpet and enjoying themselves at the after parties. It looks like everyone was having so much fun. But maybe none more so that fellow Officianado Ben Affleck! First he married Jennifer Garner, and then he reveals he’s an Office fan – I knew I liked this guy. Jenna Fischer & John Krasinski on the Red Carpet: The cutest couple Dundie goes to Jenna and John who walked the red carpet and handled the crazy press together all night. From all accounts, they seem to be having a lot of fun together, and hey this is the most we’ve seen Jim and Pam interact in a LONG time. I’ll take what I can get. So how was it to date your co-star for one night? Read what Jenna & John had to say. Many of you saw the cast sporting little blue puzzle pieces on their tuxes and bags the night of the Globes. Those puzzles pieces represent Autism Speaks, an organization founded by Suzanne and Bob Wright (CEO of NBC Universal). When the cast of The Office leave the confines of Dunder Mifflin they have to know that people will be watching them. The scrutiny might not be that of Brangelina, but Office fans will find you if they want to. And they have. Now, I’m not going to spill any secrets here, but if you want to know WHY the cast has been on location and WHERE they have been, you should read this first hand fan encounter over at Office Tally (um spoiler alert goes without saying, right?). And let me just say that a GMMRer that we all know and love also saw The Office crew at the same location just last night. And no, it wasn’t me…the cast is sadly not filming in Boston. Yay! It’s Thursday. I have been Yahoo clip free for the past few weeks and I love it. It does take A LOT of self control, but the episode is so much better when you haven’t seen some of the funny parts. You should totally have a west coast chat if you are staying up, just saying. Anyhoo…great post again. I love seeing all the info again in one place. If i makes you feel any better GMMR after a few weeks not watching the Yahoo! clips is not that big of a deal…. God i need to watch thoughs clips!!! Great news finds as always GMMR! I’m really looking forward to tonight’s ep to see the “fallout” from Dwight quitting. I couldn’t resist the Yahoo clips, though – I don’t have as much restraint as you! 😉 But as always, tonight’s ep looks great! I’m excited about the producer’s cut as well – though I’ll have to wait till Monday to catch it as I’ll be without a computer for a few days! Does anyone know how long it will be up on the NBC website? Hi, My name is Jo and I’m two weeks off of Yahoo preview clips and I’m loving it. Good job on the yahoo clips! I think it probably gets easier over time to not watch them. Can I just say…PRODUCERS CUT!! YES!!! I, too, have been able to muster the courage and strength to stay away from the Yahoo clips for a while now. It is SO MUCH better that way so be surprised with everything when the full episode airs! Good luck making it through the day! I’m with you, GMMR, no clips for me either! Aside from scavenging around TWoP, here and OT for spoiler tidbits, it’s really so much better seeing the episode as a surprise! Excellent Office Thursday, I always love checking out what you’ve got over here! C’mon. Go ahead. I know you want to. Yahoo clips were once again irresistable to me! As an alternative, you can always check out ETonline, they have a video of the cast getting a certificate for their SAG nomination! Its not the same, but it may tide you over until tonight! Office Thursday=God’s gift to the world. I can’t wait until tonight! I think the new target may be a Mr. Andy Bernard…we’ll just have to wait and see! I’m impressed with all of you Yahoo clips obstainers (is that even a word??). I couldn’t resist and it looks like it’s going to be a good one. Thanks for the great installment of The Office Thursday, I may even be able to get on the chat tonight and I’m looking forward to it. I can’t get the Melissa Rivers clip to play, it’s the only interview I haven’t seen, if anyone can help with that, I would be so grateful. All the other interviews were so funny and fantastic. Jen, I bet your right about the new prank target, only a few more hours until all will be revealed. I just got one of your Team Pam shirts in the mail for an early birthday present! Thursdays truly are the best days ever. I, like some others here, have also been off the yahoo clips for a looooong time. They definitely ruined the episode for me and i enjoy being surprised w/ it when it airs. I’ve also stayed away from the deleted scenes on NBC’s website. They’ve been posting so many of those that i feel like there will be nothing left for the dvd. So i’m staying away from those, too. However, i am SUPER excited for the Producer’s Cut! Yay! I’m with Kris – in addition to staying away from evil Yahoo, I’ve been saving the deleted scenes for the DVD. You know, for some reason Thursdays end up being the worst day of the week for me work-wise, and then I come home to Office Thursday and all the stress and frustration melts away. I love it! Omg I loooove the office…..Thursday is now my favorite day of the week! A mi me gusta la office porque es muy interesante. Mi charactor favorita es Pam. Y me gusta el queso.